The following closures will take place on Sunday for the Five Borough Bike Tour. The lower level of the Verrazano Bridge from Brooklyn to Staten Island will be closed from 12:01 am to 6 pm. The Brooklyn-bound lower level will also close at 12:01 am. Two lanes will reopen about 8 am. The upper level will be open in both directions. Traffic exiting the Hugh L. Carey (Brooklyn Battery) Tunnel in Brooklyn will be diverted to Hamilton Avenue from 10 am to 3:30 pm. The FDR Drive ramp to the RFK Triboro Bridge will be closed from 8 am to noon; all Manhattan-bound traffic must exit at 125th Street. 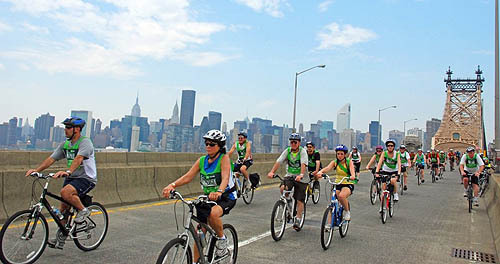 There will be street closures in all five boroughs on Sunday between 7:45 am and 6:30 pm for the Five Borough Bike Tour. Click here for details. One of three eastbound/outbound lanes on the Brooklyn Bridge will be closed on Saturday from 6 am to 2 pm to facilitate bridge maintenance. The South Upper roadway of the Manhattan Bridge Brooklyn-bound will be closed on Saturday and Sunday from 7 am to 7 pm for repair of deck joints on the roadway. During these times there will be two lanes open on the lower roadway outbound/eastbound and two lanes open on the north upper roadway inbound/westbound. One of two eastbound (Queens-bound) lanes on the south upper roadway of the Ed Koch Queensboro Bridge may be closed from 6 am to 2 pm Saturday and/or Sunday through June to facilitate overhead lighting work. The Grand Street Bridge over Newtown Creek will be closed on Saturday from 8 am to 2 pm to perform maintenance and structural repairs. Vehicular and pedestrian traffic will be detoured to the Metropolitan Avenue Bridge. The south tube of the Battery Park Underpass between Route 9A/West Street and the FDR Drive and one of two lanes in the north tube will be closed from 1 am to 8 am Saturday to facilitate NY State DOT construction activity. These closures will continue until approximately July. The 6th Avenue entrance ramp to the northbound/inbound Gowanus Expressway will be closed from 11 am Friday to 5 am Monday to facilitate NY State DOT roadway work. This weekend closure is scheduled to continue through June 16th. Amsterdam Avenue between 96th Street and 106th Street in Manhattan will be closed on Saturday from 11 am to 6 pm for the Valley Restoration LDC Amsterdam Avenue Festival. 6th Avenue between 14th Street and Waverly Place, 14th Street between 6th Avenue and 4th Avenue, and Washington Square North and Waverly Place between 5th Avenue and 6th Avenue in Manhattan will be closed on Saturday from 1:30 pm to 2 pm for the Cures Not Wars Parade. * Grand Concourse between 179th Street and Van Cortland Park Avenue East. * Broadway between 86th Street and 96th Street (northbound side only) in Manhattan will be closed from 11 am to 6 pm for the 25th Annual Broadway Spring Festival. * Central Park West between 106th Street and 96th Street in Manhattan will be closed from 1 pm to 4 pm for the Cinco de Mayo Parade. * Court Street between Union Street and West 9th Street in Brooklyn will be closed from 11 am to 6 pm for the Gowanus Canal CDC Court Street Festival.